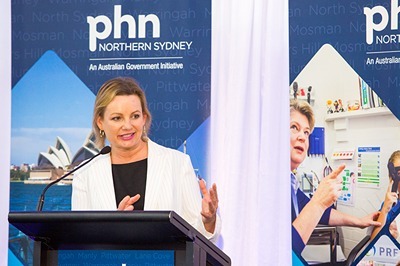 Northern Sydney PHN, operated by Sydney North Health Network was officially launched last Wednesday 9th December 2015 by the Federal Health Minister, The Hon. Sussan Ley at an event held at Macquarie University. The launch was well attended by 200 hundred guests from the local health sector and included local general practitioners, representatives from mental health, aged care and youth services, allied health providers, representatives from Macquarie University, the Department of Health and Local Health District, hospital executives and representatives from the newly formed Sydney North Clinical and Community Councils. Dr John D’Arcy (Master of Ceremonies). The Federal Health Minister The Hon. Sussan Ley – CLICK HERE to view the speech. 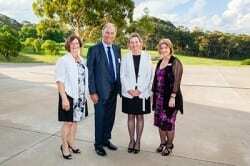 Dr Magdalen Campbell, Chair Sydney North Health Network – CLICK HERE to view the speech. Lynelle Hales, CEO Sydney North Health Network. Associate Professor Meredith Makeham, Australian Institute of Clinical Innovation. SNHN CEO Lynelle Hales, was delighted so many local health sector representatives attended the launch. In her speech Ms Hales outlined a commitment to deliver better health and better care to the people of Northern Sydney by responding to their local health needs, working in partnership with local health providers and improving the health literacy of our community.